Zinnia Franklyn met the love of her life when she was just fifteen years old, and then lost him to Hollywood three years later. Now he’s arrived on her island, hotter than ever, and ready to pick up where they left off. There’s only one problem… he’s supposedly engaged to his costar. Reed Sinhawk, television star of Engaged to a Werewolf, has only ever loved one woman. And the moment he walks back into her life, he’s determined to make her his. But will the tabloids, a jealous costar, and his overbearing father succeed in destroying his one chance at happiness? Another great read from Deanna Chase! Once you pick it up you won’t want to put it down! The good thing is that it’s on the shorter side so you can get through it in one sitting. Just enough fun and romance to let tour mind drift away! One thing I always say about this author is that she does such a great job drawing in the reader immediately with how she writes, and this book does exactly that. I loved Zinnia from the moment she was introduced and wanted nothing but the best for her, and of course that was Reed. They just seemed perfect for one another, and their love just shone through. Their path to that love was fun, and you can’t but love the story. If you love sweet romances, you really need to read this book and author. Both are stunning! I really do highly recommend! I received a complimentary copy of this, and I voluntarily left a review. This is a great book; this is the fourth book in the Witch Island Brides series written by Deanna Chase. Zinnia Franklyn met the love of her life when she was just fifteen years old, and then lost him to Hollywood three years later. Now he’s arrived on her island, hotter than ever, and ready to pick up where they left off. There’s only one problem, he’s supposedly engaged to his costar. This is a great book with a fun story and well developed characters. Once I started reading this book I didn’t want to put the book down until the end. 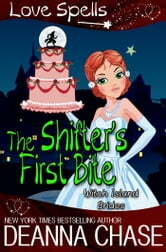 If you love a paranormal romance with plenty of laugh out loud moments then you need to read this book. I can’t wait to read then next book by this author. I voluntarily reviewed an advanced reader’s copy of this book. The free book held no determination on my personal review.